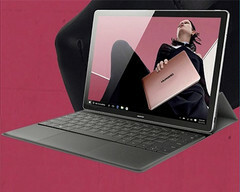 The company's CEO has recently revealed that the three upcoming Windows 10 laptops by Huawei are scheduled to be unveiled at the end of next week as MateBook D, MateBook E, and MateBook X.
Huawei is not a big name in the laptop/convertible market, but this might change in the coming years. The three upcoming MateBook laptops all run Windows 10 and are expected to hit the market as MateBook D, MateBook E, and MateBook X. Although Huawei's CEO confirmed that these portables would be unveiled on May 23, the specs are not official yet. However, according to the latest rumors, the MateBook X is the one to watch. Its specs are expected to include an Intel Core i5 processor and 8 GB RAM. The MateBook E is a less powerful machine, using the Intel Core M chip. At last, the MateBook D looks like the less interesting one of the pack, but there are no details to mention at this stage. In addition to the boring black/dark gray finish encountered in many laptops and convertibles these days, silver and gold color options are also expected to be offered at least for one or two of the new MateBooks. We will get back to them next week as soon as they become official, so stay tuned.